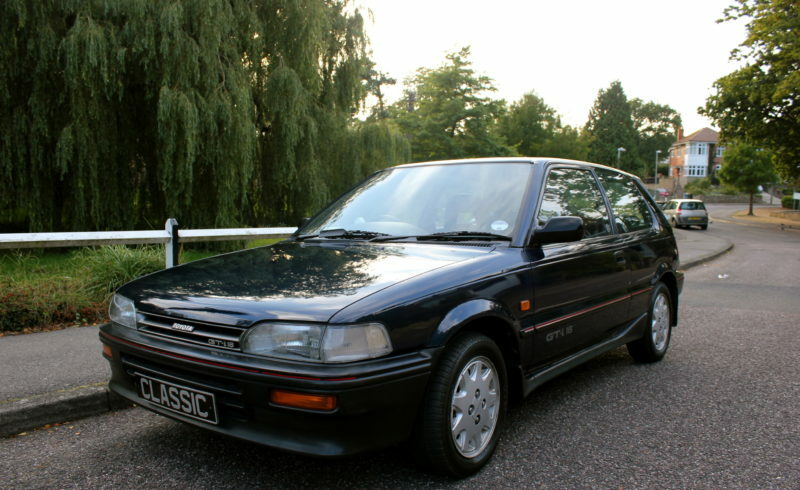 Toyota Corolla GT-i 16v (AE92)– One of the first of the GT-I 16v to be produced, an early 1989 model, very rare and original. It has the legendary 4AGE engine with the best engine available at that time, with the 123 Bhp 16v. It has the same engine as the Toyota Corolla Gt Coupe the “AE86” as it is known. It is excellent throttle response and has an excellent exhaust tone. It has been maintained regardless of cost, though it hasn’t ever been wanting much. It was serviced throughout its live by an Ex-Mclaren mechanic who was a close friend of the owner. It has just had a service with an oil and filter change. The paintwork on the car is very good and is completely original, there is the odd mark and scratch as to be expected with a car of its age but never the less excellent for its year. The interior is untouched and is like new, we don’t think the rear seats have ever been used. For a car of 1989 it definitely feel much much newer. It Starts up first time on the button without fault, true Japanese reliability. The engine and gearbox are so smooth its like driving a new car, really it has to be driven to be believed, truly fantastic. These cars are known to suffer with rust, but this particular car has been lucky as it has been kept garaged and away from adverse weather condition. This has kept this car in far better condition than others around today and is pretty much rust free!! The only small amount of rust we manage to find on the car was in the drivers side rear wheel arch. It has now been rust treated, professionally welded and sealed. It has had a new battery recently and cam belt done a few thousand miles ago. It comes with a new 12 Months Mot. Overall a very rare opportunity to acquire a true collectors car and a future classic, which will only continue to rise in price.